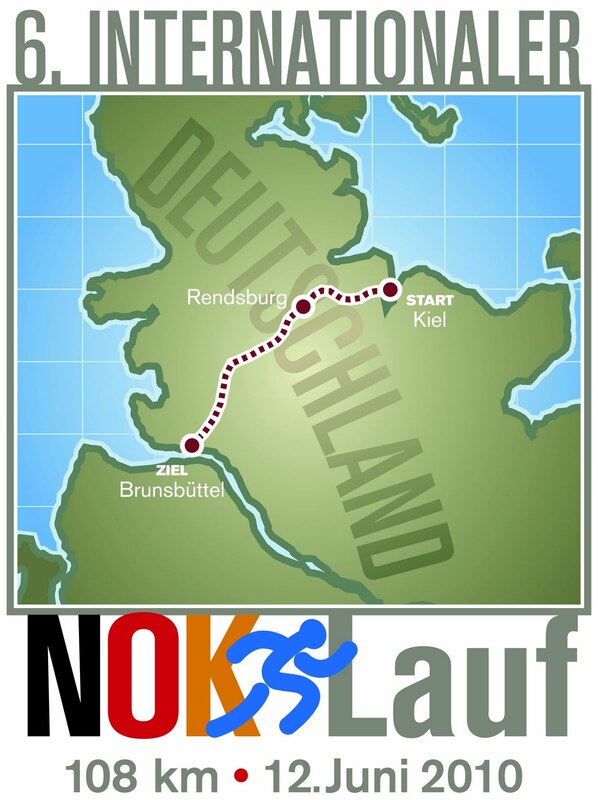 On June 12, 2010, I was one of only 15 runners lucky enough to participate in the sixth annual and ultimately last running of the "Nord-Ostsee-Kanal-Lauf", a 108K (67 mile) ultra marathon along the entire length of the Kiel Canal. The Kiel Canal opened in 1895 as Kaiser-Wilhelm-Kanal, a name it kept until 1948. The Kiel Canal is roughly 100 kilometers in length and links the North Sea at Brunsbüttel to the Baltic Sea at Kiel. It was built to save ships an additional 450 nautical miles they would otherwise have to travel around the north cap of Denmark. As a result, it is the most heavily used artificial seaway in the world with over 48,000 ships passing through annually. Since this is a charity event that attempts to raise funds rather than spend it on race swag, and since I was lucky enough to be invited/accepted as one of the few race participants, I figured it would only be appropriate to create a couple of race shirts for the Race Director in memory of this great event (the image above was designed by a co-worker of mine, who shall remain nameless until he has a chance to agree or decline to be named). While this ultramarathon was fully sanctioned and certified by the German Track & Field Association as an official race, there is one aspect that sets it apart from any ultramarathon that typically takes place on the North American continent: Because this race is run as a charity event for the German Multiple Sclerosis Foundation with the motto “Running for those who cannot run any longer”, the social aspect was in the foreground of this race. As a result, participants run as a group, from start to finish. There are also logistical, insurance and liability issues requiring this format. As race director Karl-Heinz Jost would state after the race, “Every finisher is a winner”. This format would present some interesting issues related to group dynamics not encountered during a normal ultramarathon race event. However, all participants solved this challenge with flying colors. A couple of runners had already assembled and volunteers were inflating balloons and hanging up the banner for the start line that also identified the cause we would be running for (the picture below shows us runners under the start banner with balloons that we would release right before the race in recognition of the German Multiple Sclerosis Foundation). The combination of the cause and the unusually long distance and location of the race (along a canal) also piqued the interest of local newspapers, radio stations, and even regional TV stations. I felt like a celebrity, giving interviews for a regional TV station (Norddeutscher Rundfunk) before the race and the sports segment of one of the local radio station (Welle Nord Radio) at an aid station around mile 45. I'm sure it had more to do with the fact that I was the only one to travel from the US to participate in this event than with my athletic abilities;-) In any case, it was quite exciting and a new experience, I had never given any interviews before, during or after any sports event. It was somewhat of a paradox. On one hand it was a low key event with only 15 invited runners, on the other hand TV and radio stations were covering the race. It was definitely a great way to raise awareness for Multiple Sclerosis and I am glad to have been allowed to be part of it, especially since it was the last time this event was held. Next year, the canal will be under long-term construction and the RD had to make the difficult decision to end the event for good, since a detour would no longer justify the term "canal race". As can be expected from a race in Germany, runners took off at 7AM sharp after a brief speech by the mayor of Kiel (who would join us for the first few miles of the race) and to the countdown of the representative of the MS organization. After briefly making our way along a couple of yachts and the Kiel-Holtenau canal lock, we entered a single track trail along the canal (see picure below), which would later turn into a dual track trail of concrete tiles and asphalt sections allowing utility crews and their vehicles direct access to the canal. However, the canal road/trail is mostly used by bikers, hikers, runners and anglers. The first aid station came way too quickly after only 5k. However, I was told that we would have aid stations every 5-9k throughout the race, which presented quite the challenge when all of us would come into the aid stations at the same time and having to leave at the same time. It added a significant amount of time spent in the aid stations, but I would very much appreciate the numerous aid stations later on in the race. It really helped mentally to be able to break down the race in such short sections when you begin to struggle in your first 100k race and are pushing beyond the longest personal distance to date. For me that began after 52 miles or 85 kilometers. Running into the first aid station, I finally got to see the much touted buffet style feeding station and it did not disappoint. Every runner even had his/her own cup provided by the race crew to avoid the use of paper cups. Since my first name is a very common name in Germany, my cup was labeled with the nickname "Martin USA" (See picture below). The participants included 13 runners from around Germany and a couple of expatriots (another German living in Denmark and myself living in the USA) with various levels of ultra experience from first time 100K participants to experienced 2100K transcontinental racers. Initially, the race presented two major challenges. First, to be able to finish the race, and second, to be able to run and finish the race with this group from start to finish, never separating from the group by more than a few yards. However, shortly after the race, the weather decided to add yet another challenge. After about the half marathon distance, we had to take a detour across a farm to circumvent a construction zone at the canal and what would an ultra marathon be without getting lost. Aparently, the entire group misunderstood the instructions provided by the race doc right before we crossed through the farm. As a result, we took a wrong turn and ended up in the wrong forest referenced in the directions (the picture below does not require any comments). As we got back onto the right trail, we were able to enjoy some of the flat but beautiful countryside away from the canal. Once we got back to the canal, we would not only have to deal with a very strong headwind for the race, but it also started to rain steadily shortly after the race started. Unfortunately, I had opted to pack light and my only shelter against these unpleasant conditions was a light windbreaker that kept the rain out, but also kept the sweat in (The picture below shows what the trail looked like for most of the race as well as the conditions we dealt with early on). After 3 or 4 hours, the rain became intermittent and the sun would peek through every once in a while. As a result, myself as well as other runners played a continuous game of taking our running packs off to take off our windbreakers or to take off our packs to put the shells back on, on and off, on and off, so it went for the next few hours. After covering the first marathon distance, we arrived at a major aid station in the city of Rendsburg, where we were welcomed by families afflicted and affected by MS thanking us for our efforts in raising awareness through this race (See picture below). After a brief photo opp and another symbolic release of balloons we were off again to continue on our way. Just in time for this aid station and for our next section of the race, the rain subsided, the sky cleared and the sun provided warmer temps about 6 or 7 hours into the race. The sheer distance of the race and the requirement to run together as as a group provided ample time to interact with each other. I had the pleasure to meet so many nice fellow runners, including a new personal hero of mine. Steffen Klitschka of Thuringa is an experienced ultra runner, who was born legally blind with only 5% of his vision remaining. He has to be an inspiration to anyone, not just people with disabilities and that was certainly true for me. He also provided the quote of the race after about 80K completed, showing an incredible sense of humor when a volunteer at the aid station asked if anyone was wishing for a new set of legs (obviously addressing us runners in reference to the distance already covered) to wish Steffen responded "Tomorrow, my answer might be different, but right now, I'd take a new set of legs over a new set of eyes". As the weather cleared up, everyone's mood got even better than before. It became evident to me that you couldn't have created a better group dynamic if you had tried. Noone was left behind. 34 miles into the race, another first for me in an ultra. Due to construction on one side of the canal, we had to cross the canal with a ferry at Breiholz to run a 10K section on the other side of the canal before taking another ferry at Oldenbüttel at mile 40 to get back again (See picture below). Interesting little fact, when German Emperor Wilhelm built the canal, he declared that citizens would never have to pay any toll or fare to cross this canal via ferry. Before heading across the canal, we were greeted by an accordionist at the aid station playing traditional shanties, typical for this northern region along the coast. The headwinds were even stronger on the other side of the canal as the wind was blowing across the water with nothing blocking it from us. After 40 miles, these types of wind conditions started to become as much a mental as a physical challenge, trying to maintain the pace we all had settled into. Along the way, we were frequently joined by pacers from different local running clubs. Once again proof that runners are an unselfish and supportive bunch around the world. Around mile 50, we encountered another challenge. You wouldn't think that there would be stair climbing involved in a canal race. However, since vehicle access to the canal is limited, this section of the race required us to climb these stairs to get to the aid station. Exactly 136 stairs that felt like eternity at this stage of the race (See picture below). Leaving this aid station was even harder, having to climb down these stairs. At least we only had a half marathon and a 5K left to run;-) Running along the canal, we got to see numerous ships going by in both directions. This included tankers, cruise ships, container ships, yachts and even canoes in some areas. Running along settled into a consistent pace, you have plenty of time to pay attention to your environment. And this environment was all about ships from around the world in all shapes and sizes (See picture below). As dawn approached, we entered the final stretch of the race. During the final 10 miles, one of the other runners severely struggled, physically and mentally and nearly unable to even move forward, let alone run. However, while most of the group were still capable to run at a faster pace, we stayed together to ensure that all of us would complete this memorable race. This group showed real character during this phase. Everyone was ready to be done. Multiple runners (including myself) had either blisters and other aches and pains that appeared to be amplified with the slowing pace. Slowing down to a near walk also started to affect us from a temperature perspective as the cold of night coupled with the cooldown of our bodies really caused some serious shivers and chills. However, noone broke away from the group and at 11:30PM the entire group of runners, escorted by RD Karl-Heinz Jost, was welcomed at the finish line by the mayor of Brunsbüttel with a case of beer. Numerous other spectators had assembled to welcome the race participants before we were transported to a local gym to take a hot shower and to receive our awards (See picture of race swag and awards below). Finally, I would like to take this opportunity to thank RD Karl-Heinz Jost for putting on such an excellent event and for inviting me to participate (The picture below shows Karl-Heinz and myself at the final aid station). I am sad to see such a well organized and run event for such a great cause disappear, but I am proud to call myself a finisher and "NOK-Ultraman", one of only 60. I would also like to thank our race doc and team coordinator Dr. A. Bonnemann, who ensured that everyone was physically ok to continue at every aid station. Additional thanks go to A. Heitmann, the representative for the German Multiple Sclerosis Foundation, along with all the other volunteers and crew members, whose names I sadly cannot remember. Only they made it possible for me to complete this race, my first 100K event. Lastly, I want to thank all of my fellow race participants for being such a fantastic group of people. I couldn't have spent 16 hours of my life with a nicer group of runners. Please click here for TV coverage of the race for a program called "Schleswig-Holstein Magazin" on NDR 3, a regional TV station. Please click here for an interview I gave at the 60K aid station for the sports news on NDR Welle Nord, a regional radio station. For an article in the local newspaper "Kieler Woche" covering the race, please click here. The newspaper "Lübecker Nachrichten" also published a nice report here. For a web album with plenty of pictures of the event, please click here. Sorry, Rich, didn't mean to delete your comment, was just trying to fix a display issue.